Discussion in 'Gen 3 Prius Care, Maintenance & Troubleshooting' started by darkgiant, Feb 26, 2017. 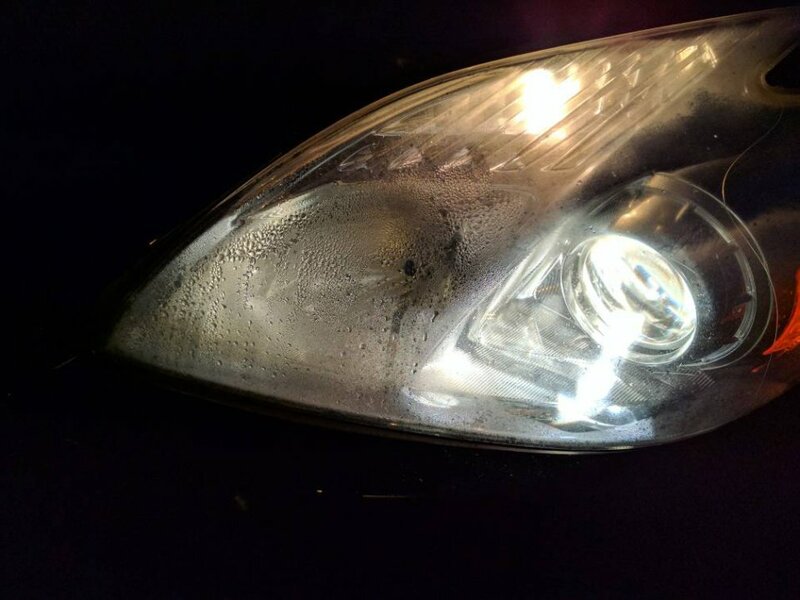 My front driver side headlight has been having major condensation issues, it's definitely not water leaking in, as it's only happening during colder weather. I disassembled the headlight, and had applied silicone glue around the seams and had did my own water test by filling up the headlight and then blowing on one of the holes (to see if their was a leak where water was entering) but there was nothing. I thought maybe the silicone glue should do the trick. Fast forward now, the issue still exists, I've also noticed ever since I cleaned the headlight, the light coming from the headlight doesn't seem too strong, maybe when I tried cleaning the lamp I did a poor job, so I'll have to go back and double check on that. So I'd like to ask, what other culprits can be causing this condensation? 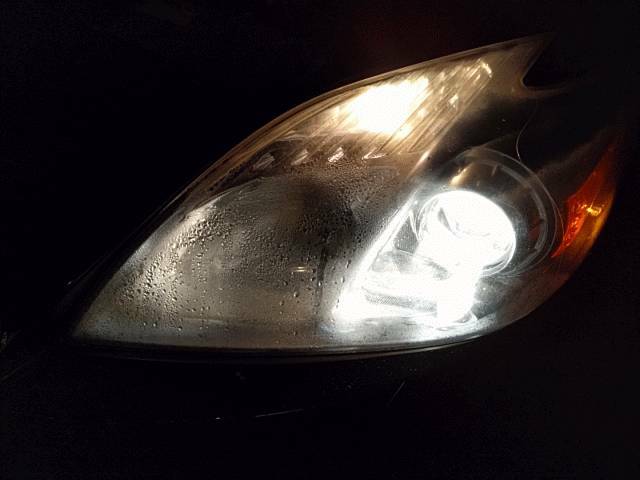 I know I can go out and get a new headlight, but I'm trying to hold off on that for now, especially since I rarely drive at night, it's just hideous to look at with all the water inside. 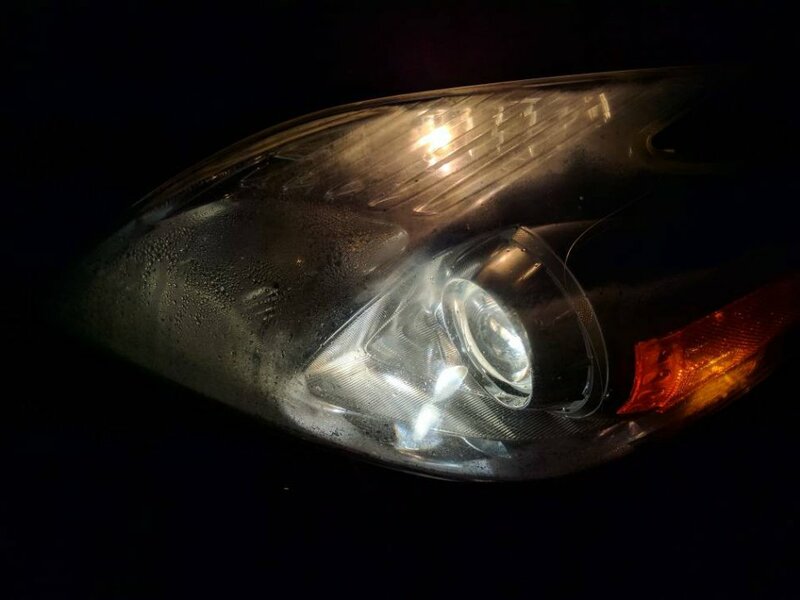 Attached some pictures of what the headlight looks like as of right now. Did you get the housing thoroughly dried out when you sealed it, so that you know that moisture is new, not preexisting? Lol, yes I did dry the headlight completely when I sealed it, I used a heat gun (I made sure to set it up so it doesn't melt the headlight, just keeps the box which I stored it in warm to dry the condensation). There was no condensation couple of days ago, as it was a bit warm. The weather has gotten colder, and that's when I saw the condensation. Do note that warmth alone does is not sufficient to flush out the moisture from the interior of the housing. Warmth can convert a lot of visible liquid into invisible vapor, which then converts back to liquid condensation again when the structure cools down. It needs to be cold and dry. Set some kind of blower to flush out the air, through the bulb mounting hole, for an hour or so. Though I don't have a decent feel for how much condensable moisture that volume can really hold. Those pics do show a lot of it. Even when it is thoroughly dried out, seems to me this will reoccur; there must be some way the moisture is getting in, will need resealing. I understand that, but I do want to note, I cleaned the few weeks go, where the weather was around low to high 50 degrees Fahrenheit. I had made sure that no form of condensation left, I did this leaving ta heat gun on for roughly 30 minutes in a cardboard box, and keeping a thick cardboard in between the headlight and heat gun (so it doesn't damage anything), then used compressed air for 10 minutes and there was literally nothing. This was all done when the headlight was disassembled. Which is why I ask what other things could be the cause, I've seen a lot of Gen 3 Prius's with this problem, but when I disassembled the headlight, I saw no possible areas for water to get in, and tiny cracks or holes. So you did also blow air through it, to flush out moisture.  - been driven in the rain or snow, or only when not precipitating? - been parked just inside, or outside too? I have the same issue, did you ever get this resolved? I did not, I tried pretty much everything, from literally cleaning the glass where the bulb projects with soap, to something a bit more abrasive. I, however, did manage to fix the condensation problem, by doing a good ol' New Yorker 'hood mechanic style: drill couple of holes on the headlight. The holes being drilled instantly cleared up all water condensation. I have to assume that the long periods of condensation just damaged the projecting glass thingy which made the light seem dim. I instead just bought a new headlight assembly. You can go through all the things, but I eventually realized, for something as a headlight, I'd rather just fix it as soon as possible then delve on with creative ideas to solve the problem. If water getting inside/condensation is the problem, and not dim lights, and the seals around the headlight seem fine, I'd personally just drill a hole (or two), might be frowned upon here, but I'd do it an the area that is facing down towards the ground, and if you do it right, it shouldn't even be visible unless you get close enough, or point out the holes. I had water condensation problem to my other cars, it became foggy, then dry, then foggy again, until the light became so dim and I had to replace it. But this time, it happens to the passenger side of my 2011 Prius, and it has been 2 months -- and the water is still there, it seems that it will never dry. This is really weird, feels like water get in, then it get sealed inside, nowhere to go, just keep circulating. Is it possible that water find its way in through the high beam bulb socket? I remember it's just a plastic twist. Maybe that's the weakest link? Honestly, that is my suspicion. I bought new headlights and the passenger side sometimes has some water inside and it really ticks me off because I spent quite a bit on them. I noticed at times the seal where the bulbs go into the headlight to have some water, so that may likely be the fault to the condensation issue. Fortunately, I noticed that once I start driving ~10 minutes, the water usually goes away, so I assume if it isn't developing in large amounts, it isn't terrible. Nonetheless, it definitely is an issue for the 2010-2011 Prius's as I have seen quite a few Prius's of those years with similar headlight issues. I left the car out last week during thunderstorm for nature's free car wash. The car wasn't driven during the rain and when i moved it into the garage, there was condensation on the passenger side. I don't think the leak is from the high beam socket since it was dry and no traces of water dripping nearby. I just took out the high beam out for a couple of days and the condensation went away. Just FYI, a while back i didn't "vent" the housing and let it evaporate by itself. I noticed that the chrome part at the top of the housing were rippled a bit.